Henri-Georges Clouzot has often been compared to Alfred Hitchcock as a master of thriller filmmaking; ironic due to the competition between the two filmmakers later in their respective careers. However, while the rest of us continually focus on the few masterworks that have endured throughout the decades, much of the filmmaker’s early work has been shunted to the side. The infancy of his career in movies is awash in a multitude of different genres and styles - from musicals and melodramas to sports films and comedies. While the filmmaker wouldn’t direct his first feature film until in 1942, his career throughout the 1930s spanned writing and translating scripts, dialogue and even song lyrics for well over twenty films. While studying political science in Paris, he became a budding playwright, eventually impressing producer Adolphe Osso enough to be sent to Studio Babelsberg in Berlin, translating scripts for foreign language films. During this period, the considerable social upheavals and cultural shifts in Germany deeply alarmed Clouzot, with the rise of Nazism eventually leading to his firing in 1934 due to his close relationship with Osso, who was Jewish. However, while newly working in Germany in 1931, he would contribute to a swath of productions. Kino Lorber has prepared a sampling of these early 1931-1933 films, featuring Clouzot in key roles, into a double-disc Blu-ray release consisting of six features and Clouzot’s first short film. No supplemental features are included on this home release besides a mildly cheeky and enjoyable essay by author and essayist Peter Tonguette, included in the case. Dragnet Night is a 1931 drama centered on the sailor-turned-professional-boxer Georget (Albert Préjean) as he climbs fame and fortune to become the French boxing champion. After defeating former French champion Charly Stick (Constant Rémy) at a depressing sideshow, Georget enters Charly’s tutelage, and together with the circus clown Fred (Jacques Lerner), his serendipitous girlfriend Mariette (Annabella), and financial backing from the hilarious Baron Stanislas (Lucien Baroux), the team set out to take the boxing world by storm. While achieving status and clout, the life of parties and socialites prove to be intoxicating for the young champ, finding himself more out-of-shape and more in debt as the European championships draw ever closer. While possessing an enthralling cast of prolific character actors, the film is bogged down by a stiff and tired plot (even by the standards of the time), and increasingly annoying repetition that stagnates any momentum that is drummed up naturally. Director Carmine Gallone does a passable job with his stars, with Léonce-Henri Burel and Nikolai Toporkoff’s cinematography possessing several impressively executed panning shots. However, nothing really gels together all that well or builds on each other, resulting in a tepid experience with almost laughably weak fight choreography and mostly hollow chemistry. I’ll Be Alone After Midnight is an exceptionally rare 1931 musical that has precious little history readily available (that I could find). Monique (Mireillie Perrey) is a bored socialite who, after being cheated on by her husband, decides a morally-sanctioned extramarital affair is what she needs most. Not wanting to be kept waiting, she ties her address and the message “I’ll be alone after midnight” to the strings of dozens of balloons and lets them loose across the city. A selection of men see and claim the balloons, ranging from a vastly unlucky fisherman to a time-strapped businessman seemingly nearing cardiac arrest. The gaggle of gawking gentlemen all clamour about Monique’s foyer as she plays with their expectations and emotions, though a wrench has been thrown into the engine - her childhood friend Michel (Pierre Bertin) is in the running for her affections as well. Though there are moments in which the songs add some welcome levity to the events in the film, I’ll Be Alone After Midnight is by far the worst release in this collection. Not only are each of the characters highly unlikable, the film’s premise is overly trite and feels like a massive waste of time - it gives us no reason to be invested. Sure, director Jacques de Baroncelli makes use of the caricature-esque characters and goofy setup, but does nothing unique or mildly interesting with the material while playing out a typical genre exercise; it is a popcorn comedy musical, and that’s about it. Also, when compared to the other works in the catalogue, this is the film with the least-evident influence from Clouzot (besides a few witty exchanges), adhering far greater to the quintessential tropes that define de Baroncelli and co-screenwriter Pierre-Gilles Veber’s other films. Also, the opening sequence can be ignored completely, as it involves little to nothing of the events in the rest of the film beyond half-assedly stamping a moral to the story. That wouldn’t be Clouzot’s only collaboration with Veber, as they would cowrite 1931’s The Unknown Singer with Henri Decoin and Henri Diamant-Berger. French salesman and shyster Ernest (Jim Gérald) makes his way to a small Russian village in order to peddle his wares. While Ernest makes his case at the local inn, a local amnesiac Claude (Lucien Muratore) reveals himself to be a sublimely brilliant singer, culminating with the pair becoming business partners. While touring under the mysterious moniker “the unknown singer,” the pair fill theatres, stadiums, and radio waves, becoming an utter sensation. However, Hélène (Simone Cerdan) a former lover from Claude’s life before his amnesia, hears him on the radio and unsurprisingly drama ensues. Tonguette claims this film is “more dramatic, and more predictable” than I’ll Be Alone After Midnight, and I would have to agree. However, I feel that this is a significant step up, and may just be the most well-crafted entry in this whole collection. The plotlines are steeped in classic cinematic melodrama, though most performances are void of hammed-up mannerist acting, which results in a thoroughly fun experience with some deeply affectionate moments. It was directed by Viktor Tourjansky, a highly individualistic Russian filmmaker who emigrated to France after the Bolshevik Revolution, and had co-directed (though uncredited) the 1928 Academy Award-winning film Tempest. But most notably, it was shot by the brilliant veteran cinematographer Curt Courant, who would film The Man Who Knew Too Much for Hitchcock hardly three years later, and each scene bears his trademark inventiveness. The strength of the direction, and impressiveness of the multi-layered shot compositions and movements, make The Unknown Singer a true treasure of the 1930s. The last work to finish off the first disc is the Clouzot’s directorial debut short, The Terror of the Batignolles. A burglar (Boucot Fils) has entered a ritzy apartment and has begun pilfering its valuables. However, his plans are cut short when a couple (Germaine Aussey, Jean Wall) enter the apartment and realize that he is there, despite his half-witted attempts at camouflage. Instead of calling for help or apprehending the crook, they start commenting loudly on how they are about to commit joint suicide, all at the robber’s expense. This is an energizing comedy of errors where we see Clouzot’s directorial style is already fairly advanced, and his understanding of story, tension, and perspective is readily on display. The sardonic snark of the characters is hilarious, the twists throughout the brisk experiment are sufficiently surprising, and the actors are on-point with their timing and reactions, so we are swept along for the ride with relative ease. This early work is a perfect example of where Clouzot was mentally and emotionally in his career at that moment, with clear indicators of what heights his filmography would eventually come to ascend. The final disc begins with the most convoluted of the films included, My Cousin from Warsaw. Though Clouzot would share writing credits with Franz Schulz and Karl Noti, he was responsible primarily for the French adaptation directed by Gallone and shot by Courant, with the latter pair of writers behind the original German-language version directed the same year by Carl Boese. The banker Archibald Burel (Gustave Gallet) has been instructed by his doctor to take a sabbatical for his health, which becomes a large inconvenience to his wife Lucienne’s (Madeleine Lambert) affair with their next door neighbor Hubert (André Roanne). While his suspicions toward the pair grow, and he dedicates himself to writing a truly dreadful opera, their cousin Sonia (Elvire Popesco) arrives from Warsaw. When Sonia is convinced by Lucienne to seduce Archibald to draw his attention away from the cheating pair, Archibald tries to convince her to seduce Hubert so that he may win back Lucienne. As plans blend together and fold in on themselves, nothing that results is at all what is expected. Because of all the wacky hijinks that occur throughout the numerous subplots and overlapping infatuations of its characters, it can sometimes be a chore to fully grasp everything that happens. However, unlike I’ll Be Alone After Midnight, this film is vividly aware of the horribleness of these conniving individuals and allows many instances to fully explore why these people are just downright horrible - you end up only appreciating Sonia by the end of it all, which I interpret as pretty much the point. Popesco leads the cast with her fiery performance, almost akin to a European Mae West, and brings home the film’s seeming core messages with an ironclad resolve. While certainly lagging in several areas (most notably clear continuous editing), My Cousin from Warsaw is thoroughly entertaining, albeit marginally confusing. Tell Me Tonight is a French comedic musical, released in 1932 with simultaneous British (Be Mine Tonight) and German (The Song of Night) adaptations, with all versions directed by the highly innovative and eclectic Anatole Litvak. This variation was translated by Clouzot from the original German screenplay by Irma von Cube and Albrecht Joseph. The opera singer Enrico Ferraro (Jan Kiepura), worn out from his incessant touring and “motor-mouthed” manager (Clara Tambour), manages to give his entourage the slip while sneaking aboard a train heading to the Riviera. He makes quick friends with the sarcastic Koretzky (Pierre Brasseur), and the pair stop at a remote village to enjoy a secret holiday. While there, the press catches wind to their shenanigans and soon descend on the town, with the town’s mayor Pategg (Baroux) and resident socialites turning up to welcome the giant star. Soon the pair’s antics to toy with their paparazzi pursuers get them into a whole mess of trouble, especially when the beautiful Mathilde (Magda Schneider) starts to catch on. This is by far the most meandering of the films present in this release, with plot elements and character interactions occurring with little regard to what came before and to what comes afterwards - many sequences ultimately feel useless or padded between the more engaging elements. This is a musical, though much less in the sense that I’ll Be Alone After Midnight is, as several of the songs are literal performances of the protagonist, rather than a standard blending of music and melodrama that is common to the genre. Baroux is brilliant (as always), and Brasseur is genuinely hilarious, though there is a sparsity of romantic chemistry between Kiepura and Schneider to actually carry the movie, resulting in lukewarm sincerity at best. While completely serviceable and enjoyable while it lasts, it is also the most forgettable feature of these early Clouzot efforts. The final film in this package is the comedy Dream Castle, which is a French-language adaptation of the Hans Zerlett-penned German film, The Castle in the South, the both of which were directed by Géza von Bolváry and released in 1933 by UFA. In the film, a movie crew are shooting a film on ships in the Adriatic Sea. The director (Marcel André) asks the commander (Jaque Catelain) of a nearby naval vessel ship if his film could borrow some sailors to be extras, with the commander playing the minor role of the prince, without realizing that this seafaring man is the actual Prince Mirano. While traveling via a truck convoy to the next shooting location, the sailors, Mirano gets lost with some of the cast and the cameraman Ottoni (Baroux), ending up in a small town where they pretend to be part of the royal cortège to score some free food from the local populace. This lie balloons out of control when they are invited to stay the night with the nearby aristocracy, all to Mirano’s amusement. Here’s a movie for the cinephiles, as many metacinematic references and industry inside jokes are peppered throughout this zany comedy and honestly work almost every time. The cast is flush with a myriad of stellar performances, with Edith Méra and (once again) Baroux remaining the most entertaining and endearing. The whole of the silly debacle is creatively photographed by Fritz Arno Wagner, a defining eye of German Expressionism and one of the most integral and influential cinematographers of the 20th Century. Though not possessing extraordinary social or emotional depth, or overtly iconic artistic flair, Dream Castle is a delightful romp buttressed by its glossy production design and a fully committed cast and crew. Henri-Georges Clouzot may have became one of the most significant voices of thriller filmmaking in late 40s and early 50s France, but he absolutely didn’t start out that way, as these films have all stood in testament. 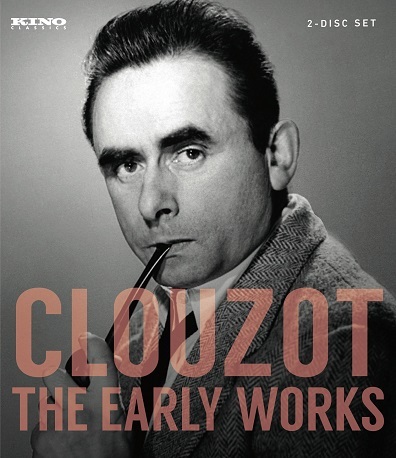 These movies included in Clouzot: The Early Works show the growing pains and experiments that the young artist underwent for nearly two decades - learning the business, honing his craft, and rediscovering his interests until he became the master we all revere.